Erin Stack left her teaching position at the School of Art and Art History at the University of Iowa to earn a graduate degree in counseling psychology. 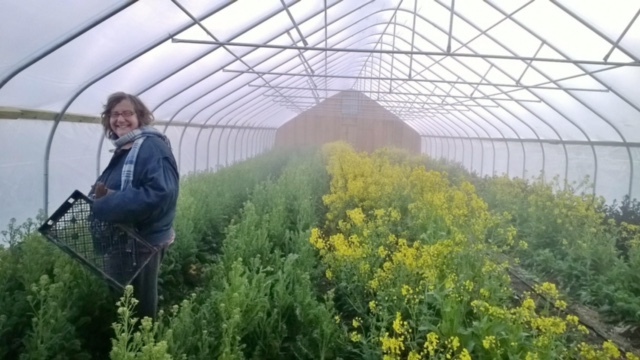 Now as an Earth Monk, she is committed to deepening her spiritual connection to Mother Earth and growing both nutritious organic produce and loving and resilient community at New Harmony Farm in Newbury, Massachusetts. The mission of New Harmony Farm is to be a model of a profitable, small scale, biologically exuberant farm and an educational/community center, that works in deep respect and harmony with Nature by using permaculture and biological growing practices. As an artist and farmer, Erin will contribute to the evolution of Willow Brook Farm in many ways. She will coach the Fellows and share her knowledge of vegetable growing so they hit the ground running and maximize the productivity of the land. Erin will also be integral in developing Phase 2 of Willow Brook Farm’s vision, to develop its artist in residence program and guide the development of workshops and programs to bring artists and farmers together to promote sustainable living.